Why Is This Refill Unavailable? Unfortunately, these Logic PRO Refill Capsules are currently unavailable in this strength and flavour. They will be coming soon to Vape Mountain, so watch this space! In the meantime, this flavour is currently available in 6mg and 12mg nicotine strengths. 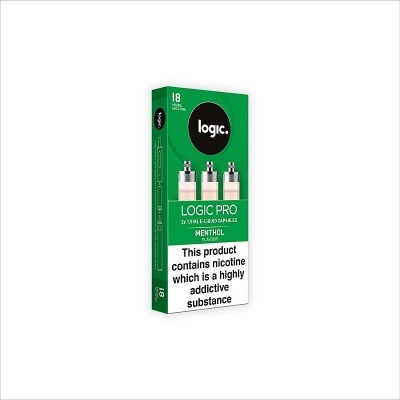 For use with the Logic PRO E-Cigarette, the Logic PRO Refill Capsules Menthol 18mg provide you with the classic menthol flavour you've been looking for. Each pack contains three e-liquid refill capsules with 1.5ml of e-liquid, designed to be spill-free for pop-and-go vaping. Cool and refreshing, the Logic PRO Menthol E-liquid provides a minty menthol flavour that's designed to satisfy. Perfect for any time of year, these e-liquid capsules provide a minty flavour blast that will leave you feeling cool and refreshed. Bulk Offers Available from £3.23 per Pack! Vaping with Logic PRO is a more affordable alternative to smoking, and now we're offering bulk packs to make it even cheaper! Our bulk offers are available in quantities of 6, 12, 24, and 48 with increasing savings, allowing you to get your Logic PRO capsules for as little as £3.23 per pack! How Do Logic PRO Refill Capsules Work? Logic PRO Refill Capsules are designed to make vaping as convenient as possible with a pop-and-go design. Each capsule has a built-in coil, so all you have to do is pop the capsule into the capsule case, and you're ready to enjoy satisfying and consistent vapour! How Do Logic PRO Capsules Taste? Since the heating coil is built-in to each capsule, there's no coil maintenance and you know your coil will never experience failure or burn-out. That means the burnt taste of other vapes is completely eliminated, providing consistent and flavourful vaping with each puff. What's in Logic PRO E-Liquid? Logic PRO e-liquid is made with a perfectly balanced mix of 50% vegetable glycerin and 50% propylene glycol (you may have heard these referred to as 'VG' and 'PG' in other e-liquids. This helps to evenly distribute the flavour and nicotine throughout the the e-liquid while providing plenty of vapour, consistent flavour and a satisfying 'throat hit'. Are These Capsules Really Spill-Free? Unlike other pre-filled e-liquid cartridges, Logic PRO capsules truly are spill-free. The vacuum sealed design of the capsules prevents spillages, saving you from waste and also preventing you from coming into direct contact with the e-liquid. With no mess and no hassle, these are some of the best capsules around. How Do I Tell When I Need a New Capsule? Logic PRO takes the guesswork out of vaping, as the device includes a convenient viewing window so you can see the level of your e-liquid. When the level gets low, simply pop in a new capsule and you're ready to go! How Much Nicotine is in Each Capsule? This pack of Logic PRO refill cartridges provides you with three capsules that have 18mg of nicotine per millilitre of fluid. This is considered a high level of nicotine, as other Logic PRO capsules can contain 6mg or 12mg per ml. Where Are Logic PRO Capsules Made? Logic PRO pre-filled e-liquid capsules are UK-made using pharmaceutical-grade nicotine and European-sourced ingredients and food-grade flavourings. All Logic products meet the high quality and safety standards required by European regulation. Which Vapes Can I Use This Capsule With? These Refill Capsules are compatible with the Logic PRO E-cigarette only. You can purchase one for yourself with free UK delivery on our Logic PRO E-Cigarette Starter Kit page. What Other Flavours are Available? Please be aware that these Logic PRO Refill Cartridges contain nicotine, a highly addictive substance. Logic PRO e-cigarettes are not intended as an aid to smoking cessation and should not be used as such. They are intended only as an alternative to other tobacco products.